Podium, awards ceremony and networking at rector’s working place. Every year in the course of the „Dies Academicus“ we have an awards ceremony at the FernUniversität in Hagen for the best degree holders in 2009. And this year there was a podium about learning and sense-making in socio-technical networks and an introduction in the concept of a new research center „eKnowledge Network and Innovation Center“ (eKNIC) at the University of Hagen. 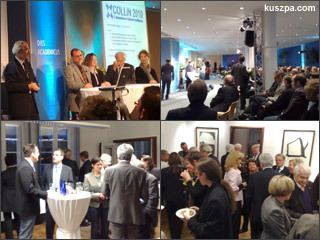 The podium was held by Prof. Dr. Gunter Schlageter, Prof. Dr. Claudia de Witt, Prof. Dr. Ulrike Baumöl, Prof. Dr. Jörg Haake and Prof. Dr. Bernd Krämer. And next year the eKNIC will have host a conference called „1. Symposium on Collective Intelligence„. Afterwards our rector invited the guests for a snack at his workplace in the „Villa Bechem“ – great time for networking across faculties.